BIO-TRICO (V) contains the fungus Trichoderma viride. Spores of Trichoderma viride controls root and stem rots caused by Schlerotina and Rhizoctonia, Wilts caused by Fusarium & Verticillium, Blights / leaf spots caused by Alternaria, Ascochyta, Cercospora, Macrophomina, Myrothecium & Ramularia, Downy mildew & powdery mildew and other Fungal diseases of cotton, cereals, pulses, vegetables, oilseeds, fruit plants and oriculture.It acts on the plant pathogens through competition for space & nutrition, parasitization, disintegration of pathogen hyphae by enzymes & antagonism. Apart from this, its metabolites stimulate seed germination, plant growth and early owering & fruit formation. It is a benecial fungus which secretes cellulase and chitinase enzymes which reacts with cell wall of the disease causing pathogenic fungi and dissolves the same. By dissolving the cell wall, the protoplasm will come out. 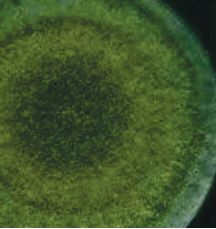 Trichoderma viride utilize the protoplasm as a source of food and multiply its spores. By this method, the spores of the pathogenic fungi are destroyed. All crops Mix 1kg BIO-TRICO (V) in 25 kg neemcake/FYM; spread in one acre eld and mix well. Seed treatment Paddy, cotton, pulses, oilseeds, vegetables- onion, garlic, ginger, cucumber & sugarcane Take 10gm BIO-TRICO (V)/kg seed and make paste in 5-10 ml water and coat seeds before sowing. Both ends of sugarcane sets may be coated by same method. Mix 2kg BIO-TRICO (V) in 200-250 L water and spray per hectare crop by knapsack/power sprayer on sighting the leaf spot. Protects crops from soil borne disease. 8 About 2 X 10 CFU/g carrier. Beneted crops : All crops – cereals, millets, pulses, oil seeds, cotton, sugarcane, vegetables, oriculture and plantation crops.